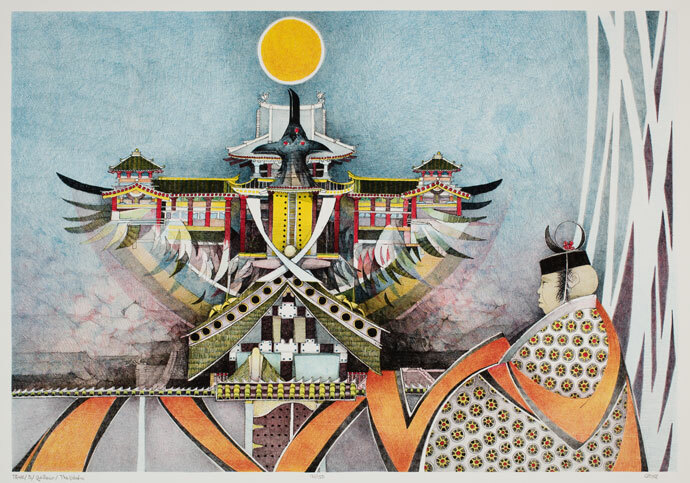 Medicine Men and Builders: The Great Human Race by John L. Doyle (American 1939-2010) depicts a visual interpretation of architecture and the many faceted medicine men who are bound together through both the physical and spiritual aspects of each. 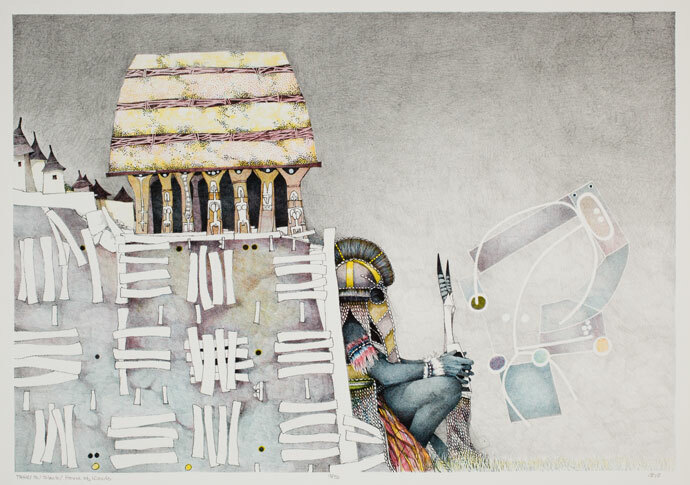 The prints are selected from two series, The Builders and Medicine Men, as part of a broader series The Great Human Race, drawn from the Art Museum’s collection. The images serve as a visual recording of the categorical statements about civilization and the cultural development of particular disciplines such as Medicine, Architecture, Law and Business. Based on drawings produced by Doyle during his many years studying ethnology and anthropology, the images reflect his fascination with the human condition and the nobility of the human spirit. The Builders presents structures that reflect mans’ hopes and aspirations, in both spiritual and physical realms, and reiterate the social, cultural and religious forces that led to their design and construction. The buildings, houses to live in, palaces to govern in, shrines to worship in, or tombs to be buried in, become an extension of man. In the past, the functions performed by the priest, doctor and scientist were astrology, divination, magic, religious rites, medicine and surgery with these duties centered in a single individual – Medicine Men. These individuals were known by a variety of names, such as: Witchdoctor, Hougan, Sorcerer, Physician, Shaman and Medicine Man. This role required the absolute belief of the people he dealt with which was generally achieved by mystical displays of power by demonstrating control over natural phenomena as a source of healing. Doyle was born in Chicago, Illinois and received his bachelor’s degree at the Art Institute of Chicago and his master’s degree at Northern Illinois University. He has had more than 50 solo national exhibitions and participated in more that 30 national and international group exhibitions and is the recipient of more than 32 awards for his work, including purchase prizes.